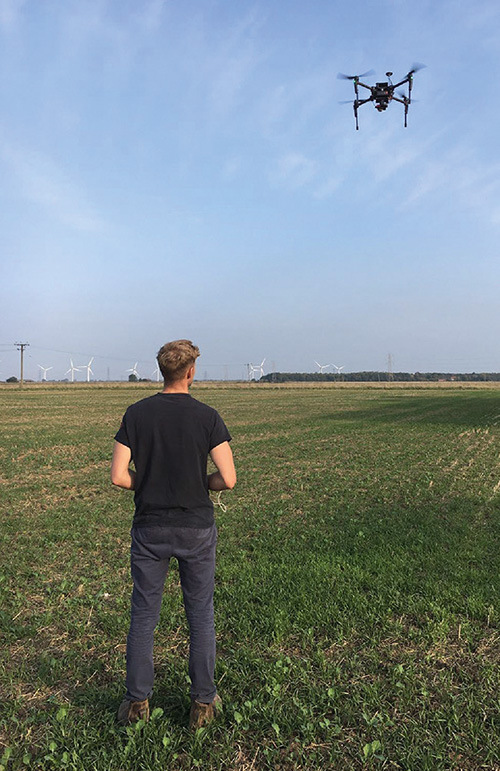 It is easy to dismiss drones as expensive gizmos with little practical benefit – but one farmer in Lincolnshire has discovered they really can help to improve farm efficiencies. Josh Ireland first got into drones when roguing blackgrass from the yields on the family farm. “I wondered if there was a way to map the black-grass in the field, and thought it was worth trying a drone,” he explains. So about 18 months ago he bought a drone and applied for his licence. When it came to buying the equipment, Mr Ireland did a lot of online research and eventually bought from a company which operates from a farm and specialises in agricultural drones. Even so, for every half day of flying it takes him up to a day to process the images into something usable. In addition, Mr Ireland has to pay £1,200 a year in insurance premiums for public liability. So how is the farm benefiting from all this investment? The first flight was rather inauspicious as the timing was wrong and the black-grass plants were too small to spot. However, Mr Ireland has learnt a lot since then and is really making the most of the technology. In autumn Mr Ireland produces establishment maps to help identify poor establishment or pest damage for improvements to seed plans the following season. Even over winter he uses the drone to check for waterlogging and to identify land drains. In February he takes to the skies again to look at the green area index to feed into variable rate nitrogen fertiliser applications. Although Mr Ireland has yet to use the drone to identify diseases, that could be next in the pipeline. “They say you can identify diseases before you can see them with the human eye, so we are looking into using it at T1 and T2 timings to work out what’s there to be treated.” In May or June the drone goes up again to check for weeds like black-grass and wild oats. “It’s good to know where your problems are for the following season.” But one thing Mr Ireland is really looking forward to is the ability to apply herbicides at a variable rate to better target weeds. However, it is not all about the drone maps: Mr Ireland overlays that data with information like yield maps from his combine and soil types. “We can then include an establishment map and use it to feed into next year’s seed plan using the variable rate drill.” So what kind of machinery does the farm run? “We’ve got a Kellands Agribuggy sprayer, CAT MT765, a New Holland 8070, Massey Ferguson tractors and a six-metre Claydon drill,” says Mr Ireland. 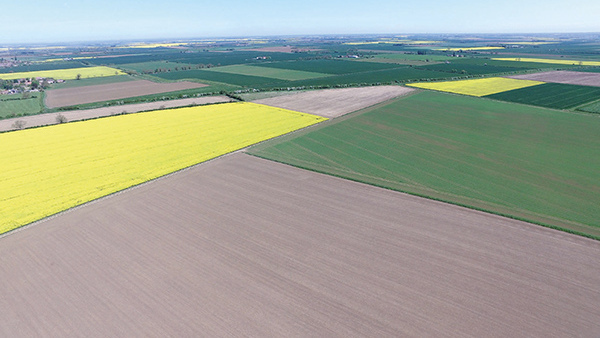 “We do variable rate drilling and fertiliser spreading, with yield mapping on the combine; everything has to be up to scratch with GPS technology.” Mr Ireland uses a DJI drone, which easily can take different cameras – including a multi- spectral camera with a near infra-red sensor for NDVI (Normalised Difference Vegetation Index) mapping. So what’s next for the family team? However, new technology will never replace good old-fashioned  eld walking to check the crops up close. “It doesn’t stop us from walking the  elds, but it gives us a bigger picture,” he explains. To cover the costs of the drone, Mr Ireland and his brother, Chris, set up a company called AgSense, offering drone services both within the farming sector and elsewhere. “If you’re flying for commercial gain you have to be licensed,” says Josh Ireland. “You do two-and-a-half days of theory training followed by writing an operations manual and then a practical test. It cost about £1,000. According to Jamie Marshall-Roberts at Syngenta, growers can use drones as a stepping stone into precision farming. “The adoption of precision farming is very low; people see it as being very complicated and difficult; even the use of GPS is low,” he explains. Using drones to assess relative greenness of the crop is very straightforward, says Mr Marshall- Roberts. Overlaying yield maps with nutrient maps and other data provides farmers with an immediate snapshot of their fields, enabling them to implement variable seed rates, both saving money and improving productivity, he adds.